Introducing the Pandora Valentine’s 2014 Collection! This Valentine’s Day show those you love they are adored with a charm from the new Valentine’s Day collection from PANDORA. From simply stated to sparkling in lights, you will find the perfect charm to commemorate a love between couples, mother’s and daughters, grandmothers and sisters, friends and family. 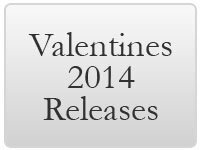 For more Valentine, love, and heart theme charms and jewelry, view Valentine's Day suggestions.